Big news this time is the North America Jew's Harp Festival is just around the corner! We are all excited about the new location and venue and hope it will be the best festival ever (see page 1). Fred Crane has just published a new book, A History of the Trump in Pictures: Europe and America. It's chocked full of Jew's harp artwork and is very beautiful... a "must have" for all JH aficionados. Guild member and artist, Ron Vinson, has several of his pointillist drawings included. I've only had a chance to glance at Ron's copy... can't wait to get one and have a great read! We've had people inquiring about the Guild and festival. Its really great to hear things like, "I'm so glad you folks are doing what you are doing. Today I took a hike with my Jew's harp; it's been a long time, and there was much beauty; pale grass blowing, bowing in the wind, songs of crickets, birds, bee wings ... for the sage is in bloom and the stream is still running". Poetry in motion! I received an email from Fred Crane saying they were desperately looking for a host for the next International Jew's Harp Congress. It had been slated for 2004 in Amsterdam but something must have happened and they are no longer able to do it. Fred asked if there was any way we could hold it in conjunction with our festival (either in 2004 or 2005). After attending the Molln Congress, we KNOW what a huge job and commitment this would be. We'd need mega funding and a slew of volunteers ... as well as a facility to house and feed all the attendees. But nothing is impossible! So, I'm mentioning this in case any of our Guild members might have some suggestions. Please contact me if you have any ideas. We will be discussing this during our annual meeting at the festival in August. Had a nice letter from long-time Jew's harper and friend, Lindsay Porteous, from Scotland. His mother passed away in January so he now has to move and try to start up again. Finances are very tight there so he is concerned about what will happen to all his trumps and many other unusual/traditional instruments. I hope all our Guild members will keep Lindsay in their thoughts and send him lots of positive energy for his new start. He also mentioned he'd heard the Grandfather Mountain Trump contest would perhaps be continued with the help of David Holt. It's an annual event that takes place in North Carolina and Lindsay made the trophy they give to the winner of the Jew's harp contest. 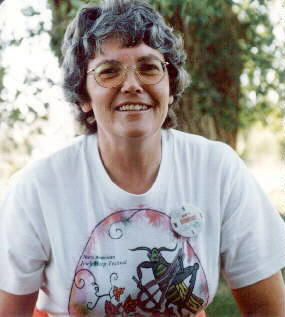 Some of our past festival attendees may remember Joy Christensen (she attended many festivals). She was the cowgirl harmonica player with the ankle-length hair ... who loved to dance with the children. Joy passed on June 3rd and she will be greatly missed. Joy was in her 70's but she seemed like 40. She was the perfect example of what its like to be a "senior" and still live life with the exuberance and "JOY" of a child. 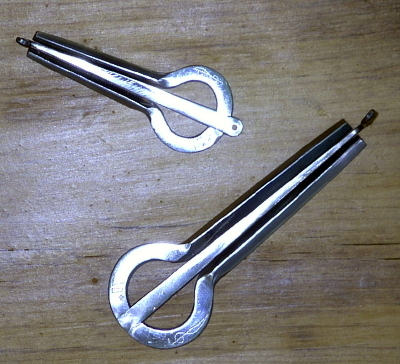 The 2003 North American Jew's Harp Festival will be held August 9 in Bay City, Oregon (near Tillamook on the Oregon Coast). Folks can arrive on Friday, August 8th and depart Sunday, August 10th (there will be casual interaction and jam sessions both days). Saturday, August 9th will be the main day. Jew's harp players (and their bands) who want to ensure stage time on Saturday will need to reserve a performance slot by 8:00 pm Friday, August 8th. All other musicians are encouraged to take part in the impromptu jam sessions. The schedule is still being finalized but we plan to have on-stage Jew's harp performances, all musician jam sessions, workshops and a Band Scramble. As always, it remains a free event and everyone is welcome. The City of Bay City is very excited to host our event. They have reserved 3 large city lots for our camping and parking (all are within a block of the Arts Center). The event will be held at the Bay City Arts Center which has both indoor and outdoor performances possibilities. Camping, lodging, food and general information will be listed on the flyer (being mailed to all Guild members) and posted on our website. Food will be available on-site: BBQ Friday night as well as breakfast Saturday and Sunday mornings. There are three very nice "eateries" in Bay City. Attendees are encouraged to bring their Jew's harp related items to sell (each vendor will be responsible for their own set-ups and items). We will have a registration booth with Festival and Guild T shirts, CD's, etc. If you plan to attend, please help us know what to plan for by contacting us as soon as possible (either by email or regular mail). I attended the Bay City Art Center Board meeting this evening. They are looking forward to preparing a scrumptous Friday evening dinner for 5-6$ a piece with b-b-q, salads, vegetarian fare and possibly fresh seafood. The better idea we have on attendance the more lavish the cheffery will be. Please forward this to your list and have people email me, call (503) 322-9607 or write Box 586, Garibaldi, OR 97118 if they plan to attend August 8. No notice is needed for the following day breakfast. 5) Hello, Now from Yakutsk [Siberia, Russia] is writing Kim Borisov. I am a participant of 3 and 4 Jew's harp festival in Molln and in Rauland. I heard about you a lot. I saw The Jew's harp society's site it is cool ~! 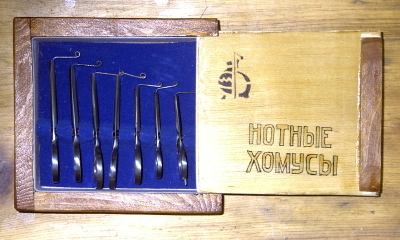 Yakutsk is too far than other region of Jew's harp society but when my friend from Germany sent me address and when I saw my photo I was very glad. Thank you to introduce with you! Bye. http://mail.yandex.ru/monitoring. due mainly to Dr. Frederick Cranes studious compilations in his trump journal, VIM. 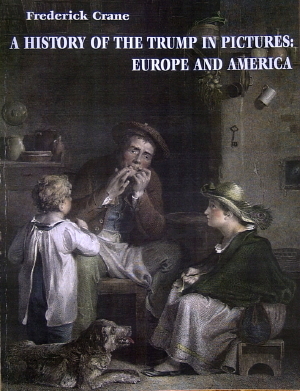 A History of the Trump in Pictures: Europe and America is noted as "a special supplement" to VIM and continues the same academic quality that Ive mentioned in previous reviews. Fred and his collaborators have gathered an impressive collection of pictorial reproductions and photographic documentation for this 182 page book. Presented in a chronological progression, the book covers known artworks that include the trump from the seal of Johannes Tr�mpi in 1353, to the modern works by such folks as Ron Vinson and Anton Bruhin. Some chapters examine common themes (The Peddler and the Monkeys), while most others deal with specific media within a time frame (17th Century Prints and Drawings). Throughout, the discussions of the subject matter is insightful, academic, and sometimes humorous. Fred thoughtfully provides reference numbers at the beginning of each subsection to the extensive Iconography . Numerous translations are also sprinkled where required, as are photographs of places Fred traveled to himself to gather insight and evidence. Among my favorite chapters is one devoted to the DEsch family of Metz, France whos heraldry and family correspondence over generations (c.1439-1535) contain many representations of trumps. Even after dedicated sleuth-work, Fred is puzzled to know "what significance the trump had for the DEsch family." Another topic I am grateful to finally understand is the history and background of the now politically-incorrect artwork contained in the British humor magazine Punch. Ive seen pictures of these before but did not know that "Punch was indiscriminate in making fun of ethic and social groups" or that the editor from 1840 to 1870 was Mark Lemmon, a Jew. Fred spends some time explaining the political climate of the times and the symbolism behind each artwork. He also notes the artists themselves. In the Afterword, Fred attempts to grapple with the Attitudes Toward the Trump. He skillfully connects the dots across the timeline; From Tr�mpis willingness to identify himself with the symbol of the trump; To the set of pictures that "seem to be related to a proverb that states that if you buy a trump, you have been cheated out of your money;" To Bruhins fantasy trumps as "an homage to the instrument." The book is quite well done, if a little dry by being an academic work. The quality of printing and reproduction is astounding (Fred was designer and printer of all but the cover and binding). Admittedly it is not the final word on the subject (there are still a few more continents to go, and works unknown at the time of compilation) but credit should be given to Fred for keeping such good notes for so many decades. And for forging the worldwide collaborations that allow all of us to see what we probably would not have been able to. It truly is a wonderful instrument. In pictures as well as song. The subject matter of the book is 179 pictures plus variants-paintings, drawings, prints, and sculptures-from the years 1353 to 2000 that include trumps or trumpists. The book is illustrated with 237 pictures, including details. The accompanying text discusses each picture or group of pictures, and draws generalizations about the trump-where it was known, how it was played and by whom, and what were the attitudes toward it. The complete list of pictures forms the appendix, with basic data on the pictures, artists, owners, and literature. There is an extensive bibliography. To order, state the number of copies required and send your payment. Payment: check on a U.S. bank, international postal money order, cash (with some risk). These methods of payment only, please. Mt. Pleasant, IA 52641 U.S.A. The PLUCK-N-POST needs more contributors! Or use the JHG Feedback form. US$12.00 each + US$ 3.00 S & H in USA (US$ 5.00 international). Allow 4-8 weeks for delivery. Sorry no CODs. The North American Jews Harp Festival is . . .
pieces of wood, and more. 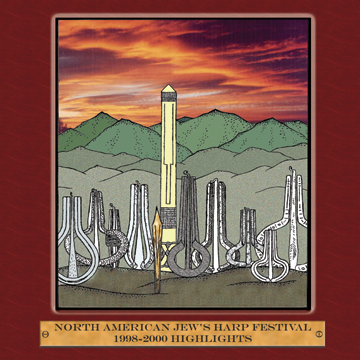 North American Jews Harp Festival. or original composition performances of the 1997 festival. The CD was well accepted at the Molln Congress. New CDs -"The Art of the Pickin' Bow"
"The Art of the Trump"